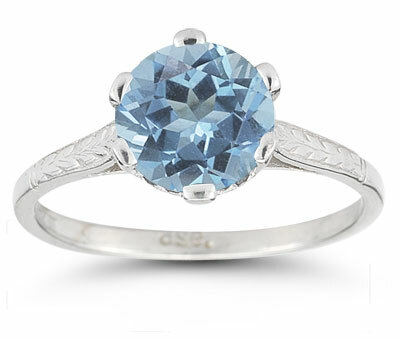 An antique-styled gemstone ring is just the right ticket to spruce up any jewelry collection, and Apples of Gold has the answer with this beautiful blue topaz sparkler. The richly colored blue stone is given a round cut to maximize the brilliance of the gem, and rests securely in the silver prong setting. The mounting for the blue topaz shows off its charming side with a small heart-shaped cutout embedded in the design. A radiant silver band echoes the vintage style with engraved leaves on either side. We guarantee our Sterling Silver Vintage Floral Blue Topaz Ring to be high quality, authentic jewelry, as described above.